I love pasta and growing up it was a special treat when my grandmother or uncle made homemade pasta, especially when it was potato gnocchi. Gnocchi is my favorite. One day I vowed I would make it myself. It has been on my to-do list for years now. Well, I finally did it. I had the time. I had the potatoes. I had the motivation. Instead of regular potatoes I gave myself the added challenge of using sweet potatoes. Sweet potatoes tend to have more moisture, so I knew it was going to be quite a balancing act with flour measurements. My uncle always said making homemade pasta is all about the feel. 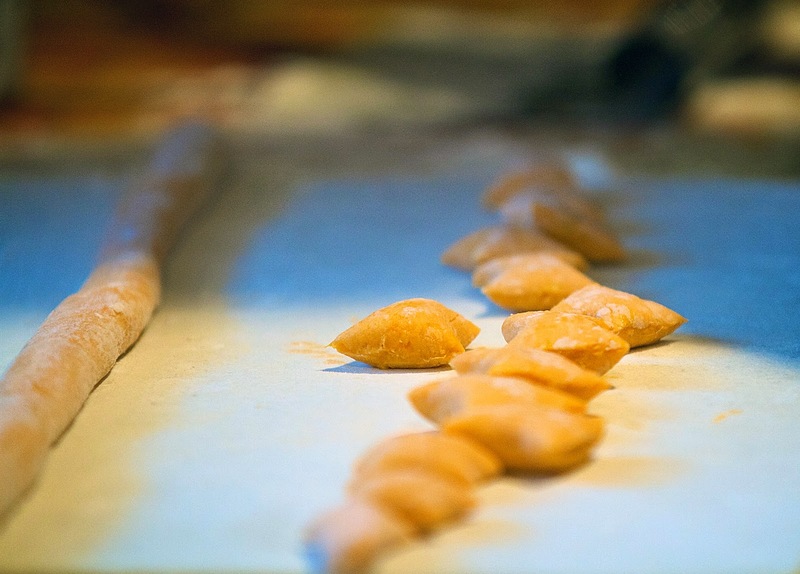 Sure you have a recipe with strict measurements, but it really comes down to the feel of dough. It just needs to feel right. I think I now understand what he meant. While based on my calculations I figured I would need about one cup of flour, I just kept adding more, tablespoon by tablespoon, until the dough felt like what I thought it should feel like - smooth, not sticky, kind of like a just fluffed feather pillow. ... to cutting it into the individual pieces and making the classic ridges. I may have been a tad nervous while making it, but with the first bite I knew I had nailed it. Oh yeah, I got this. 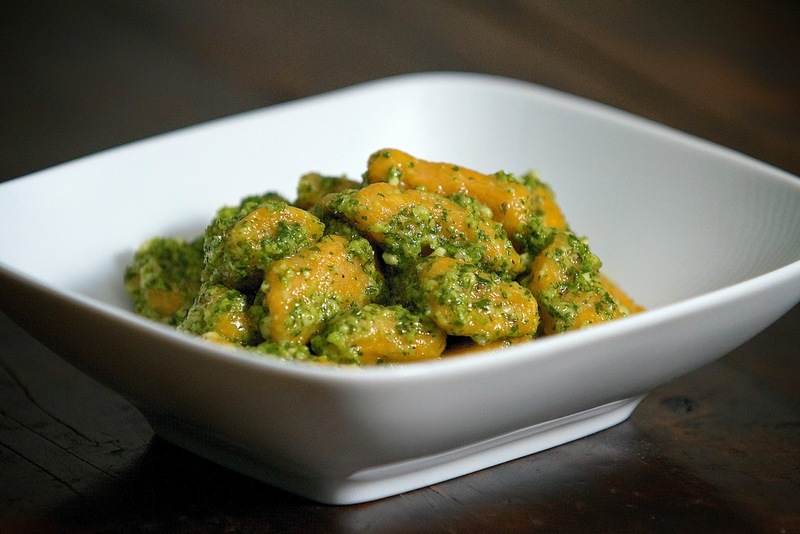 The gnocchi texture was just what I hoped it would be and the earthy, sweetness of the sweet potatoes melded perfectly with the fresh herb pesto. I highly recommend putting homemade gnocchi at the top of your recipe to-do list. It's a bit of work and takes some time, but it is so worth it. Preheat the oven to 350 degrees Fahrenheit. Scrub your sweet potatoes, pierce with a fork, place on a lined baking pan and roast for about 1 hour, until they are soft. 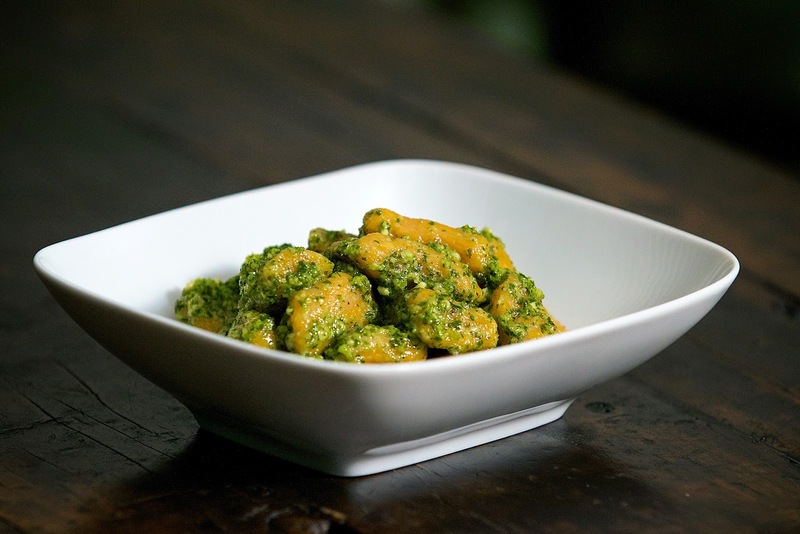 While the potatoes roast, make the pesto. Roughly chop the garlic cloves and toss into food processor along with cilantro and toasted almonds. Add a pinch of salt and pepper, put on the lid and start the food processor. With the food processor on, stream in the extra virgin olive oil. When the mixture appears well incorporated, turn off the food processor and pour the pesto into a medium sized bowl. Stir in the Parmesan cheese. Set aside. Line a baking sheet with a clean kitchen towel and set aside. This will be where you'll place the formed gnocchi before cooking. Next, flour your work surface. Then measure 1 cup of flour. Once fully cooked, allow the sweet potatoes to cool enough so you can handle them They need to be warm to form a good dough. Peel off and discard the skins. In a large bowl mash the sweet potato flesh with a fork. Turn out the mashed potatoes in a mound onto the floured work surface. Sprinkle with salt. Add some of the measured flour onto the mashed potatoes and gently work it in. 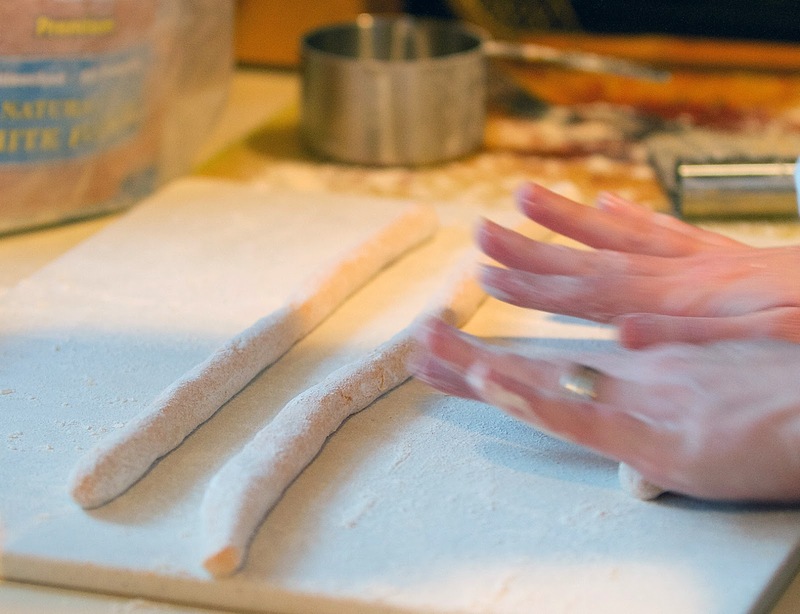 Slowly add the flour until you form a smooth dough that no longer sticks to your hands. Only sprinkle on more flour when all the previous flour has been absorbed into the dough. 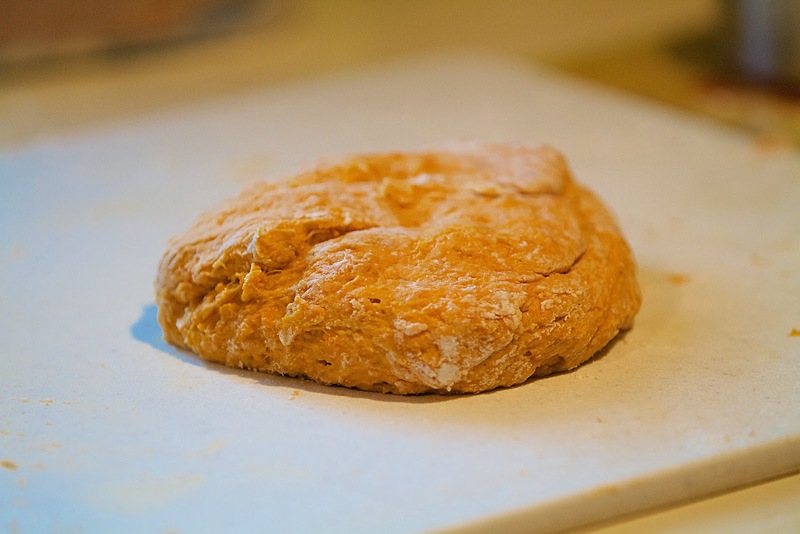 After you have used the cup of flour if the dough is still sticky add more flour little by little. 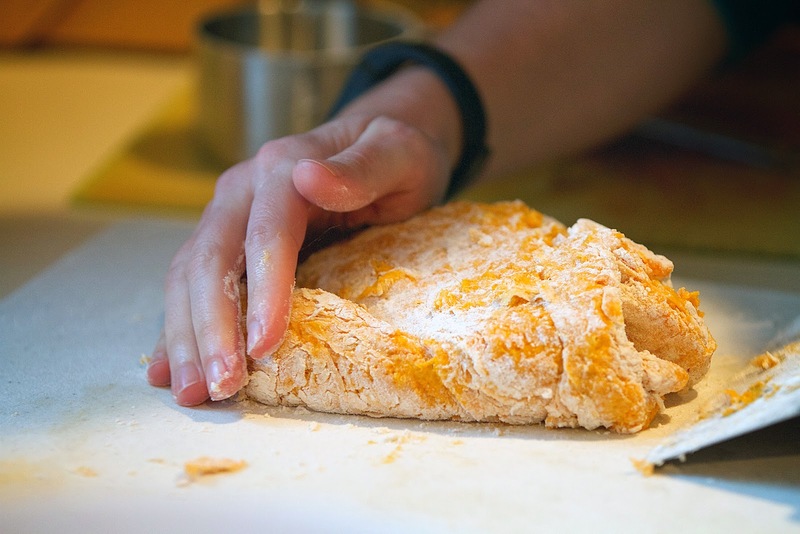 Scrape the work surface as you work to keep it smooth and free of dried bits of dough. Once the dough is smooth and feels like a billowy pillow, stop working it and cut it in half. Cover half with an inverted bowl to keep it from drying out while you work with the other half. Form the dough into ropes about 3/4 inch thick. Use a dough scraper or knife to cut the ropes into cylinders that are about 3/4 to 1 inch long. Then using a fork take each cylinder and roll it against the tines, pushing your thumb into it to form a hollow, concave dumpling with a ridged edge. If you can't get it quite right, that's OK. This step isn't 100% necessary. The ridges help the sauce cling to the gnocchi. Place the gnocchi onto the towel-lined baking sheet. Repeat this process with the remaining dough, lining them up on the towel-lined baking sheet as you go. Fill a large pot with water and bring it to a boil. Add kosher salt to the boiling water. Lift the towel off the baking sheet with two corners in each hand and position it over the boiling pot. Release the bottom two corners of the towel and drop the gnocchi all at once into the water. Cook over high heat until the dumplings float to the top. Once they float, use a spider strainer to take them out and place into a large serving bowl. Gently stir in the pesto. Note: Once formed the uncooked gnocchi can be frozen and cooked later. Keep them lined up on the baking sheet and pop the tray into the freezer. Once frozen solid, put the gnocchi into a freezer bag. When ready to cook them, just drop the frozen gnocchi into boiling salted water and follow the rest of the above recipe from there. 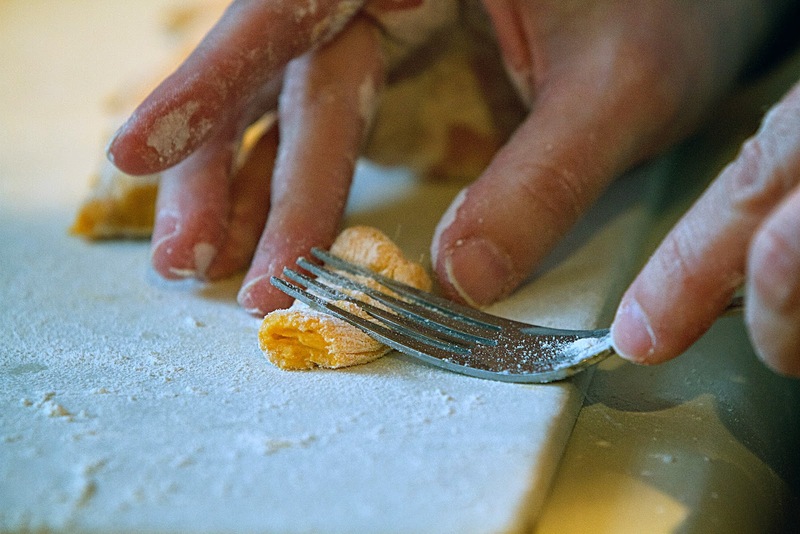 Do you make homemade pasta? What's your favorite?